Paris (AFP) - Increased Internet surveillance and tighter border checks are "urgently" needed to foil jihadist attacks of the sort that rocked Paris this week, European, US and Canadian security ministers agreed Sunday. The gathering of interior and justice ministers at the French interior ministry was held before a massive anti-terror march in Paris that included dozens of foreign leaders. A joint statement by the ministers -- representing 11 EU nations including France, Britain, Germany, Sweden and Poland, as well as the European commissioner for migration and home affairs, and US Attorney General Eric Holder -- emphasised their "determination to fight together against terrorism". They said it was "essential" that major Internet providers cooperate with governments in closely monitoring and, if necessary, removing online content "that aims to incite hatred and terror". They also want to "step up the detection and screening of travel movements of European nationals" leaving or entering the EU's external borders, and modify Europe's internal Schengen freedom-of-movement rules to widen information sharing and subject suspect passengers to greater checks. They saw a "crucial and urgent need" to establish an EU-wide database of passenger information for travel inside Europe and for flights leaving or entering the 28-nation bloc. The proposed measures are to be discussed further at a February 12 EU summit focused on reinforcing security. Holder announced a broader February 18 summit in Washington to be hosted by US President Barack Obama. The steps were unveiled after three days of carnage in Paris by three gunmen who claimed allegiance to Al-Qaeda in Yemen and the rival Islamic State group. The violence began with a bloody attack on the satirical newspaper Charlie Hebdo on Wednesday, when two of the gunmen killed 12 people. Twin assaults by French commandos on the gunmen holed up in two separate locations -- in a town outside Paris and in a Jewish supermarket in the capital -- ended with the Islamists' deaths on Friday. 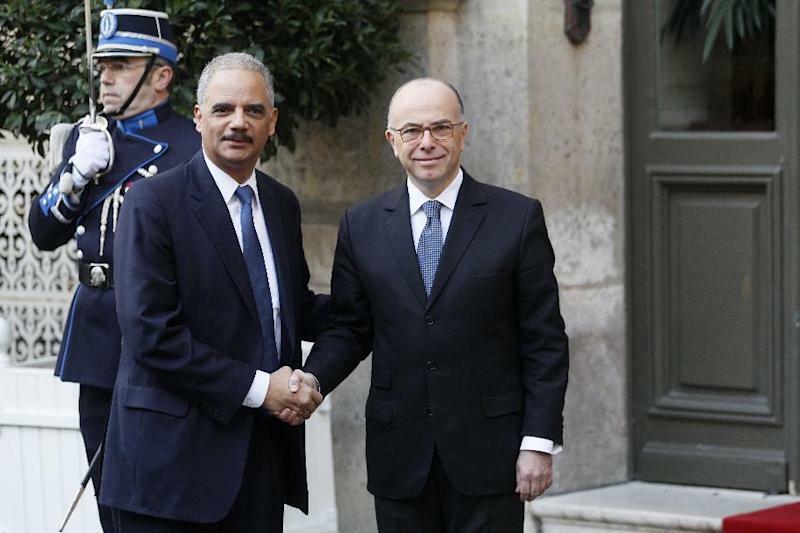 Holder said Sunday that the announced US summit would "discuss ways in which we can counteract this violent extremism that exists around the world". "Only if we work together, through sharing of information, by pooling our resources, will we ultimately be able to defeat those who are in a struggle with us about our fundamental values," he told reporters. The interior and justice ministers stressed in their joint statement that the enhanced monitoring of the Internet should be done with respect to it remaining "a forum for free expression". But there are fears by some civil liberty groups that such state pressure on private Internet companies could erode citizens' rights and freedom of expression online, especially in the wake of the scandal over electronic snooping by the United States' NSA. The increased checks on travel by Europeans was also of concern. The European parliament and others want to ensure limits are imposed on the sharing of passenger data with the US to prevent Europeans being exposed to unwarranted prying. Undermining Schengen freedoms that have opened up most of the EU's internal borders are also seen as a slapdown of one of the bloc's most cherished principles. 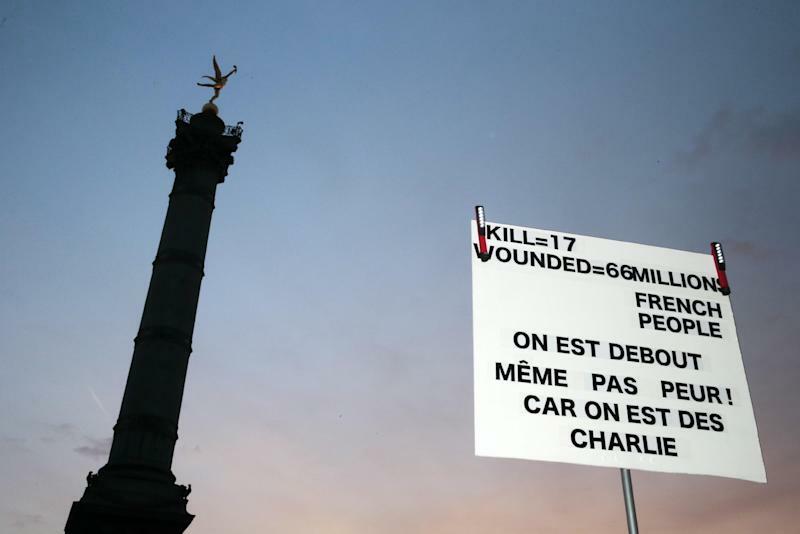 In the wake of the Paris attacks, though, voices demanding reinforced domestic security against jihadists were louder than those championing personal freedoms. The EU commissioner for migration and home affairs, Dimitris Avramopoulos, said authorities are "determined to move ahead in coordinating our efforts within Europe and with our international friends in order to give an end to this drama and this phenomenon". French Interior Minister Bernard Cazeneuve emphasised the problem of "foreign jihadist fighters in Syria and Iraq" many of whom come from EU countries -- particularly those with sizeable Muslim populations such as France, Britain and Germany. Information on them and on "terrorist networks" must be shared between the allied countries, he said. 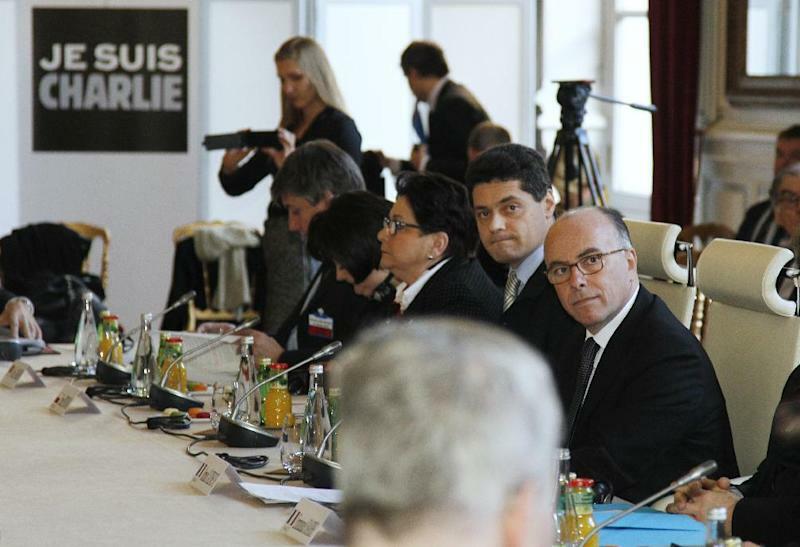 "We are resolved to fight against terrorism," Cazeneuve told a news conference. He said existing laws and organisations such as Interpol and its European counterpart Europol already played a role but that a "global approach" was now needed to counter the threat to countries that shared democratic values. He added that the focus on the Internet also highlighted the need to provide positive messages to counter jihadist propaganda attempting to radicalise European youth. The gunmen in the Paris attacks were French-born and French citizens. The two brothers, Said and Cherif Kouachi, were of Algerian descent and are believed to have been radicalised in Paris's poor immigrant suburbs. They were already on a US no-fly list. The other, Amedy Coulibaly, a serial criminal of Malian background, was thought to have become an extremist while in prison. The French government has admitted to shortcomings in its surveillance of the gunmen, who were known to its intelligence services.